In the previous two posts, Part 1 and Part 2, we gave an overview which Business Events are available in R13 and how you can subscribe to events with external applications using Oracle ICS/OIC. In this part, we will show how to filter events using XPath expressions. The approach on sending a message in case of every creation/update/deletion of a Business Object is not what might be required in a specific use case. In our previous example we showed how to publish an “Item Creation” event in case an new item has been created in SCM Cloud. One use case could be that an external system needs to have this information – but only for a specific ItemClass only. In our example we will send the “Item Creation” event only in case the item class is “Smartphones” (using a Vision demo instance of R13 GSI). In a multi-national organization with subsidiaries, events should be sent only to specific countries/regions. For example, an organization could have Oracle Sales Cloud as world-wide CRM solution, but regional different fulfillment systems, for example different for US and EMEA. In a Customer Data Management solution (using Oracle Customer Data Management Cloud) you want to send updates to all other participating system – but one external system covers only a subset of customers – for example business customers (B2B). In the next chapter, we will show two examples – for filtering Item Creation events (in SCM) and for filtering Contact Creation Events (in CRM/Sales Cloud). 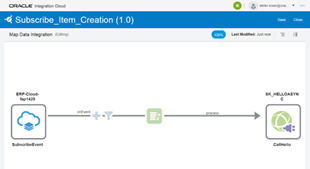 As first step, deactivate the integration previously created in Oracle Integration Cloud Service to enable editing: Read the complete article here.